Introducing Jabbado. The actual Jabbado. Impressum, or what you need to know. Whenever it comes to strange and weird things that excentric adventurers and evil fiends will serve their guests, aberrant eyestalks are very high on the list. They are hard to come by, tricky to prepare, and some say that they are also very hard to eat with that eye always going you an accusatory look. This is a variation that allows you to recreate the infamous eyestalks on pasta as served by the demon lord of forced happiness to his guests during the dedication of his layer in the abyss. If you are looking to make your own eyestalk trophy you can find the pattern and a video on Be Inspired with Dominic. If you are looking to incorporate them in your game, either as a trophy, an item, or an occurrence, check out this post at Walking Papercut. And now have fun and enjoy a hearty if eye-catching meal. Celebrate your defeat of one of the most iconic aberrations with this hearty and slightly disconcerting meal! 4 pcs Leek of the diameter pictured, larger works but is tricker to get right, see below. 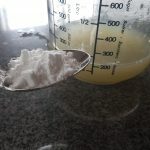 1 tbsp starch (corn or potato) This is optional, see instructions! Cook the pasta according to the manufacturer's specifications. Usually, putting them in enough salt water to cover them in the pot and let them simmer until they have your preferred consistency should suffice. 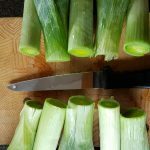 Cut off the root end of the leeks. Cut off the green part close to where the first leaf is splitting. 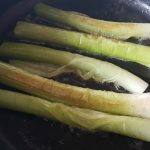 Remove the outer leaf (optional) and wash the leek with water. Heat up the broth in a pan large enough for your eyestalks. 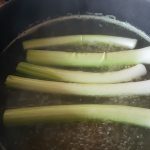 Place the leeks into the broth (without scalding yourself), put a lid on and let them simmer for 5-10 minutes. Once the leeks are soft enough (test with a fork), remove them from the broth and empty the pan. (Saving the broth is optional, see below in the Sauce instructions). 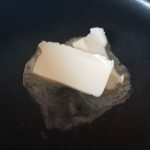 Add the butter to the pan and heat it up until it melts. 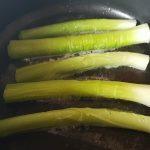 With the butter gently sizzling, add the leeks to it. Keep rotating them every now and then so they can brown on all sides. Once they are to your liking set them aside. 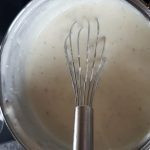 Put the sour cream into a pot and use a whisk to stir it smooth. Stir well and heat it up while stirring. Once it boils, turn off the heat and keep stirring for a minute. Optional: if you want more sauce, save some of the broth from the leeks (about 200 ml). 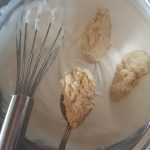 Let it cool down and, using a vigorous whisk, add a tbsp of starch to it. It is important that the broth has cooled down, otherwise, the starch will do its thing in a rather clumped, unpleasant form (ask me how I know). Add the starch-broth to the pot and heat the sauce up again while stirring until it sets. 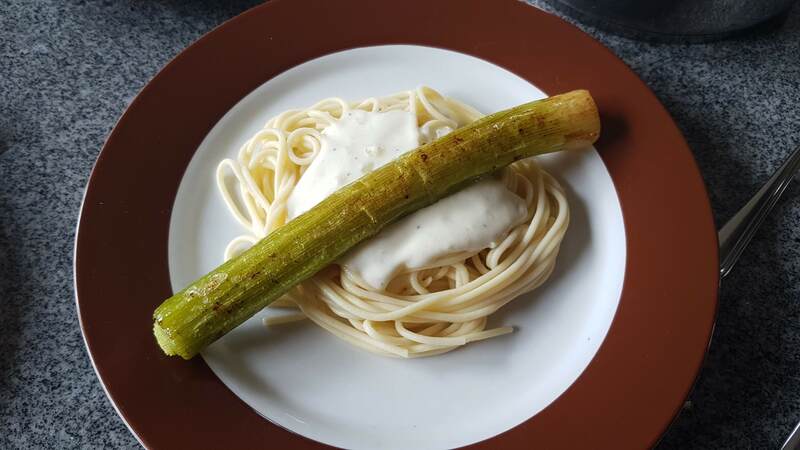 Put a serving of pasta on a plate, add sauce, and place a leek on top. Done! The most basic sentiment that this recipe comes down to is “you can eat anything if you know how to cook it”. Which probably applies to adventurers seeking out the tucked-away places in the cosmos which aberrations use to make their home just as much as anyone else. There is more information about the actual incident in our roleplaying game that spawned this idea – one of our players asking whether she could harvest eyestalks and carry one on her belt as a trophy – in the sister posts to this one on my other sites (Making an Eyestalk Trophy from Felt and On using an Eyestalk Trophy in-game). 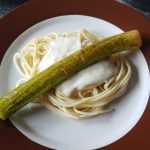 The obvious flaw of this recipe is that the stalk does not actually have an eye – but fret not, there are a couple of ways to make them just a little more lifelike. After all, you do not want too much likeness to the madness and horror that are Beholders. A starting option would be to look for leeks with a broader end. I have seen some leeks where the root end is quite bulbous by comparison, and that alone might be enough to increase the likeness. The problem, though, is that it does not help with frying, and might throw off the consistency of the stalk when it comes to ease of eating. The next step would be to add an actual eye. 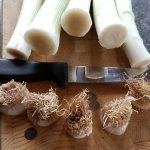 To do that, cut a little hole or depression into one end of the leek and insert something else. Depending on taste, availability, and size of your leeks, I recommend olives or almonds. Given the softness of the stalk in it’s cooked state, it is probably best to leave the hole a little smaller and push the eyeball in before serving. To mix things up you might want a different color of the stalk. Not every Beholder is green, after all. 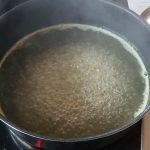 One way to try would be to add food coloring to the broth you let the stalk simmer in, although depending on the color it might or might not give you the desired effects. You could experiment with coloring ingredients like beet juice or Curcuma, but that would obviously affect the taste of the finished meal. If you are all about looks and do not care for that – or feel adventurous – go for it and share pictures! I hope you enjoyed this foray into cosmic cuisine. Check out the other recipes that Jabbado has to offer, and as always, remember to Be (and cook) Inspired!